BFA-Fairfax will take be the lone football team to represent Franklin County in the playoffs this year. 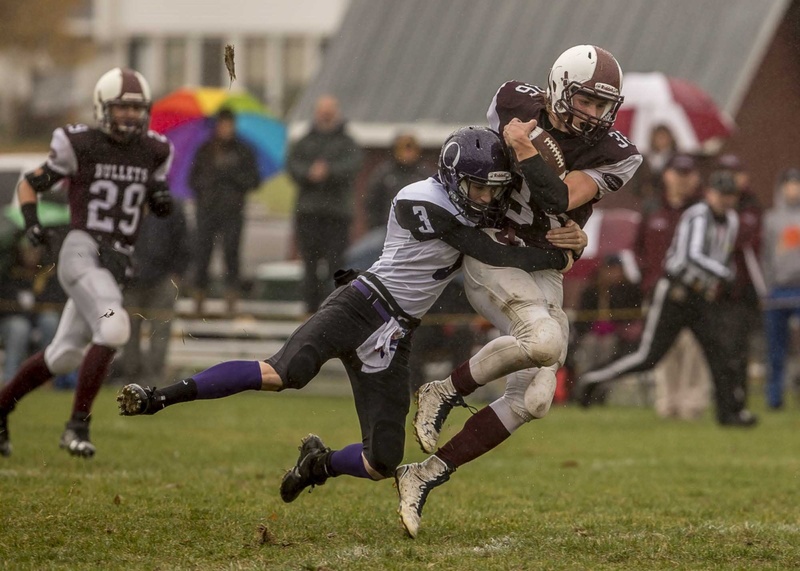 The BFA-Fairfax Bullets hammered the Olympians of Oxbow 42-6, during their last regularly scheduled game on a rainy October afternoon. Officials in the Village of Enosburg Falls are moving forward with a multi-million-dollar hydro renovation project. Just before 2 am this morning, a St. Albans Police Officer was patrolling the city when he came upon an assault victim lying in the road in front of BFA St. Albans, according to Police Chief Gary Taylor. The man was unconscious from his injuries, but later regained consciousness as the officer tended to his injuries. Democrat Sue Minter continues to out-fundraise her Republican opponent, Lt. Gov. Phil Scott, in the 2016 race for governor. One of Vermont’s two U.S. Senators, Bernie Sanders, will be in St. Albans on Sunday stumping for the Democrats and Progressives. It’s all part of a six-town rally to get out the Democratic vote. Sanders will hold rallies Friday in Montpelier; Saturday in Vergennes, Bennington and Rutland; and Sunday in Burlington and St. Albans City. Minter will attend all six events, and state Sen. David Zuckerman, the Democratic nominee for lieutenant governor, will attend five of the rallies. The rallies are said to revolve largely around Democratic gubernatorial candidate Sue Minter, but will also include Progressive David Zuckerman. This comes as Minter finds herself in a tight battle with Lt. Gov. Phil Scott (R). A Castleton Polling Institute survey released over the weekend showed Scott leading Minter by a statistically insignificant margin. Scott, who has served three terms as lieutenant governor, is winning a surprising 24 percent of Democratic voters, the poll showed. Minter, who won a competitive Democratic primary earlier this year, is only getting 5 percent support among Republican and leans-Republican voters. Twenty-two percent of Democrats remain undecided in the race. Despite Vermont’s liberal nature, the state has a long history of electing Republican governors. The last Republican governor in Vermont, Jim Douglas, won four elections until he retired in 2011. Republicans controlled the governor’s mansion continuously from 1854 to 1963.